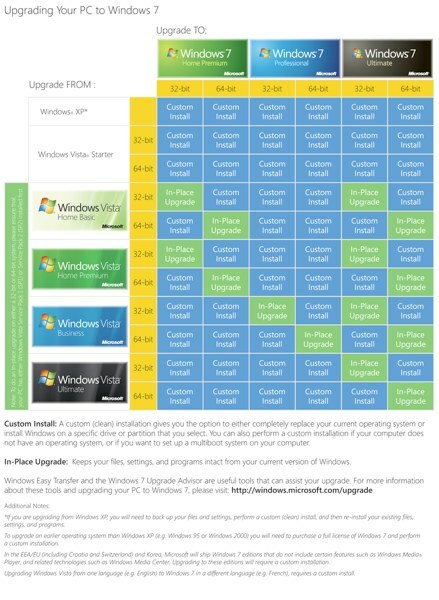 This is seriously Microsoft's Windows 7 upgrade chart, and it's ridiculous. It manages to highlight the insanity of shipping multiple OS versions while totally minimizing the good news: most Vista users will be able to upgrade in place to the corresponding 32- or 64-bit version of 7. That should cover the vast majority of people running Vista, but if you're still on XP or you're trying to do anything out of the ordinary you'd better get ready for some pain: all those ominous blue boxes require you to back up, wipe your drive, and reinstall a totally clean copy of 7. You heard that right -- the Windows 7 installer won't even try to retain your data and programs if you're not updating from the corresponding version of Vista. Pretty lame move, considering Microsoft is currently selling millions of copies of XP on netbooks and will sell XP downgrades until 2011 -- sure, we get that most netbook owners aren't going to spring for 7, but it's insane that you can't just pop in a disc and upgrade. Of course, now that 7's been released to manufacturing and the final bits are available there's not much to be done, so let's all just take a moment to contemplate the fact that Ed Bott at ZDNet managed to totally outdo Redmond's infographics people with a much friendlier chart with "about an hour" of work -- check it below. Official Windows 7 upgrade chart is ridiculous originally appeared on Engadget on Thu, 06 Aug 2009 16:29:00 EST. Please see our terms for use of feeds. August 6, 2009 by Ben Pike.